The Penobscot River is a great place to find landlocked Salmon that you can fish for all year. The West Branch is well knows throughout the land for its great fishing. 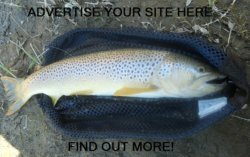 This is a great river to fish for trout. The largest mountain in Maine, Mount Kathadin, provides wonderful scenery. Don't be surprised if you see black bear or moose during your fishing trip, as they can usually be spotted from Golden Road during your journey. 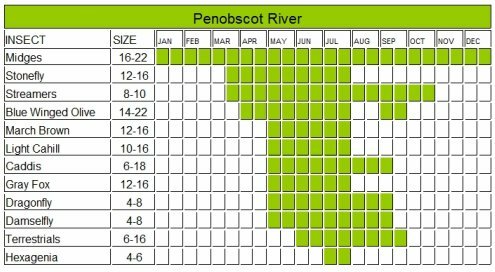 The Penobscot is not just for fly fishing, this river has numerous class IV and class V rapids so you will see many rafters during peak season. The McKay Power Station below the Gorge is a great place to find Salmon. They lurk here waiting for any thing that gets passed through the turbines for an easy meal. Getting to this spot will take a bit of a hike on some steep trails but the fishing can be phenominal. Be sure to get out of the water fast if the sirens go off, because this indicates they will be releasing water and the flow can get nasty if you are not ready. If you decide to fish from a canoe or other boat you must pay close attention at all times to the current. There are many rocks and rapids at various spots along the river that can turn a great day into a nightmare, so be real careful. 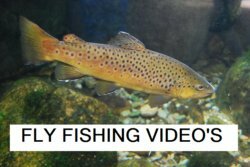 Some areas of the Penobscot River that you will want to track down to fish would be at Holbrook Pool, and Sourdnahunk Falls. 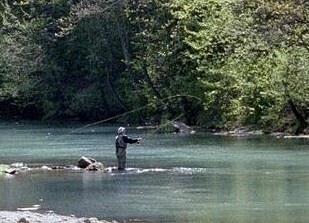 Both of these areas have great water to fly fish using various nymph patterns. When you see this water you will immediately recognize that fish will be there. This river is best fished in the late spring and early fall. There is a private toll road that follows the West Branch for over 30 miles from Millinocket to Ripogenus Dam. There is access to the river from countless trails that run along side this stream. The river is normally fishable year round and some fly-fisherman will use a drift boat, while others will wade. This river is very popular in the area and it gets a lot of pressure, but there is plenty of water for everyone. In addition to the landlocked salmon there are some nice Brook trout as well. Leave the Penobscot River page and return to Maine page.